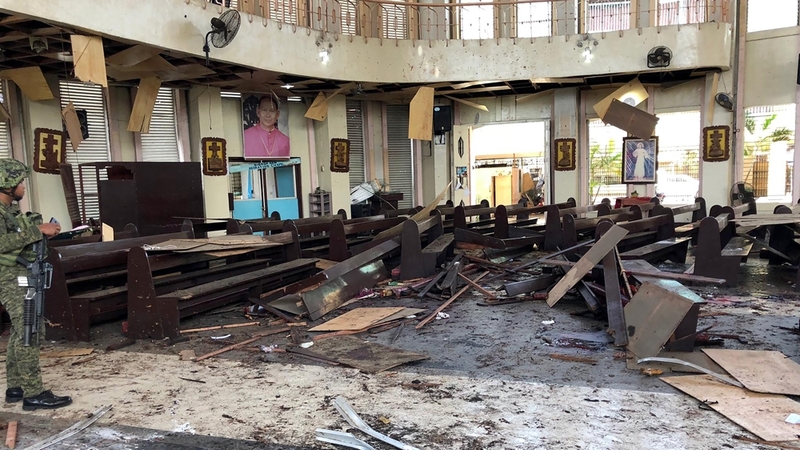 Over a dozen people have been killed in two bomb blasts at a Roman Catholic cathedral on the southern Philippine island of Jolo, where the Abu Sayyaf group and other armed fighters are active. Sunday’s incident claimed the lives of at least 15 civilians and five soldiers, police said, adding that 77 others were injured. The number of fatalities was revised after police said earlier that 27 people were killed. The initial explosion scattered the wooden pews inside the Cathedral of Our Lady of Mount Carmel and blasted window glass panels, and the second bomb hurled human remains and debris across a town square fronting the church, witnesses said. President Rodrigo Duterte’s Spokesman Salvador Panelo condemned the “act of terrorism” and vowed that government forces will pursue the perpetrators of the attack. “The Armed Forces of the Philippines will rise to the challenge and crush these godless criminals,” he said.In a separate statement, the Philippine Army said the explosions were likely caused by improvised explosive devices (IEDs). “We condemn this dastardly attack on the civilians who were peacefully attending church services,” a statement from the military said. “I have directed our troops to heighten their alert level, secure all places of worships and public places at once, and initiate proactive security measures to thwart hostile plans,” said Defence Secretary Delfin Lorenzana in a statement. Bishop Angelito Rendon Lampon served as a priest at the Cathedral for almost two decades, until his transfer to Cotabato, another city in Mindanao, last week. He said many of his former parishioners were shaken following the attack. “I know many of the victims because I worked there for 21 years. I am praying for the victims and their families,” Lampon told Al Jazeera. “We are condemning this attack. Those who are responsible have no respect even for the sanctity of the place,” he said, adding that the priest, who was officiating the mass at the time of the bombing, Fr. Ricky Bacolcol, “was still in shock and could not speak about what happened”. According to Lampon, the first of the two explosions reportedly happened while the parishioners were saying their offertory prayers. Jolo has long been troubled by the presence of Abu Sayyaf, an armed group blacklisted by the United States and the Philippines as a “terrorist organisation” because of years of bombings, kidnappings and beheadings.